Cloud computing has become a cost effective way for businesses to keep up with the latest technology. As more and more services are moved to the cloud, there are issues related to complying with legal process. 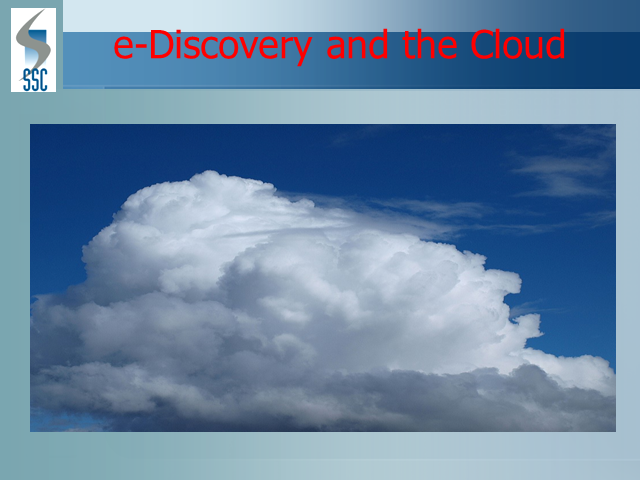 This presenation will focus on some of the technical and policy issues related to Cloud Computing that the legal profession need to address. Gerard Johansen, SSC Inc.'s Manager of Information Assurance will present an overview of Digital Forensics and e-Discovery geared toward the legal community. Cases of fraud and sabotage occur in businesses of every size. SSC, Inc. will use case studies to highlight the dangers posed by insiders as well as practical steps to reduce losses from insiders. SSC, Inc. protects businesses with a full range of corporate security services such as Security Consulting, Pre-Employment Screening, Professional Investigations, I/T Network Security, Specialized Training Services, Computer Forensics/Data Recovery, Vulnerability & Risk Assessment and Business Continuity Planning.